$75.00 per bottle. $810.00 per case. 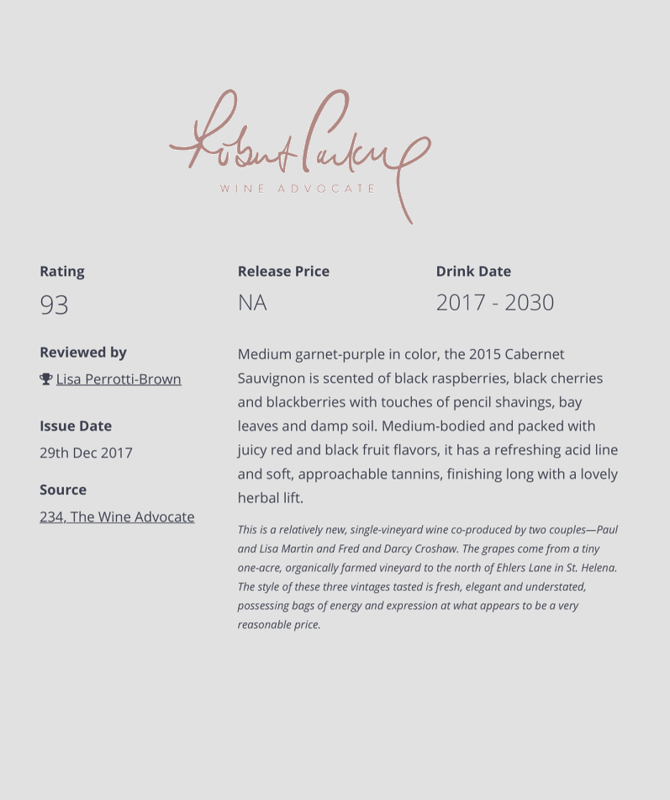 We are delighted to release our 2016 MC4 Cabernet Sauvignon. It will be our eighth vintage, crafted by gentle weather, ideal terroir, near-obsessive farming (by Fred and Paul) and the talents of our winemaker, Victoria Coleman. We produced 150 cases. A barrel sample, the 2016 Cabernet Sauvignon sports a medium to deep garnet-purple color and nose of crushed wild blueberries, black cherries and mulberries with touches of cigar box, baking spices and dark chocolate plus a waft of sage. Medium to full-bodied, the palate features appealing restraint, with taut, muscular fruit and fantastic tension, finishing long and softly textured. This is a relatively new, single-vineyard wine co-produced by two couples—Paul and Lisa Martin and Fred and Darcy Croshaw. The grapes come from a tiny one-acre, organically farmed vineyard to the north of Ehlers Lane in St. Helena. The style of these three vintages tasted is fresh, elegant and understated, possessing bags of energy and expression at what appears to be a very reasonable price. It’s a gorgeous wine, ready to drink now with red cherry, black cassis and blackberry aromatics, a sumptuous body, silky tannins and a lengthy, elegant finish of red and dark fruit, all beautifully integrated and softened with French oak. We produced only 88 cases. Click Here for the Wine Advocate’s review. The 2014 growing season was nearly Napa Valley perfect with steady moderate temperatures that produced even ripening, optimal flavors and a bountiful harvest. An extraordinary wine from an extraordinary year! Only 126 cases were produced and as with our past vintages, we expect it to sell out quickly. Our winemaker’s notes. The sixth release from the hand tended MC4 Estate. Dark fruit, red pomegranate and subtle brown spice notes are darkened by roasted sage and ripe plum aromatics. A focused entry widens, revealing dark berries, cassis and dark chocolate, accompanied by red lift and dimpled texturing. We are delighted to release our 2013 MC4 Cabernet Sauvignon. This is our fifth vintage of MC4, each year a product of land, climate and meticulous organic farming on just one hillside acre within the St. Helena appellation. Each vintage is a unique expression of time and nature, of perfect location, of dedicated farming and winemaking. The 2013 growing season was nearly perfect with steady, moderate temperatures that produced even ripening and optimal flavors. Our 2013 MC4 is a sumptuous wine with lavish red cassis and fresh blackberry aromatics and a remarkably lengthy soft finish of plum and red cherry. An extraordinary wine from an extraordinary year! Only 96 cases were produced. The 2012 weather was nearly perfect for Cabernet, and this year’s wine promises to be our best wine yet! We’ve been pleased by our early tastings: flavors of cherry, black currant, licorice and a hint of mint. The tannins and structure are beautifully refined and elegant. We harvested the 2012 vintage on October 14, 2012 at 25.4 brix. Pressed to French oak barrels in November 2012, the wine aged for 20 months before being bottled on July 14, 2014. 98 cases were produced, and this vintage will be released in the fall of 2014. The wine is elegant and refined with delicate aromatics of sage, red currants, blackberries and cherry tones on a long finish of red fruit. We picked the grapes in mid-October, 2011 at a brix of 23.5, pressed to French oak barrels in November and bottled 19 months later. We’ve sold out of our 37 cases produced from the 2011 vintage. Our 2010 wine is our second release. The aromatically distinct cherry tones and hints of berries, minerals, licorice and a floral spiciness reflect the unique qualities of our vineyard. The wine is intense with subtle French barrel tones with a structure that will age beautifully for the next 15 years. We harvested on October 20, 2010 at a brix of 24.0 and pressed to a French oak barrel (medium toast Sylvain) several weeks later where it aged for 18 months. 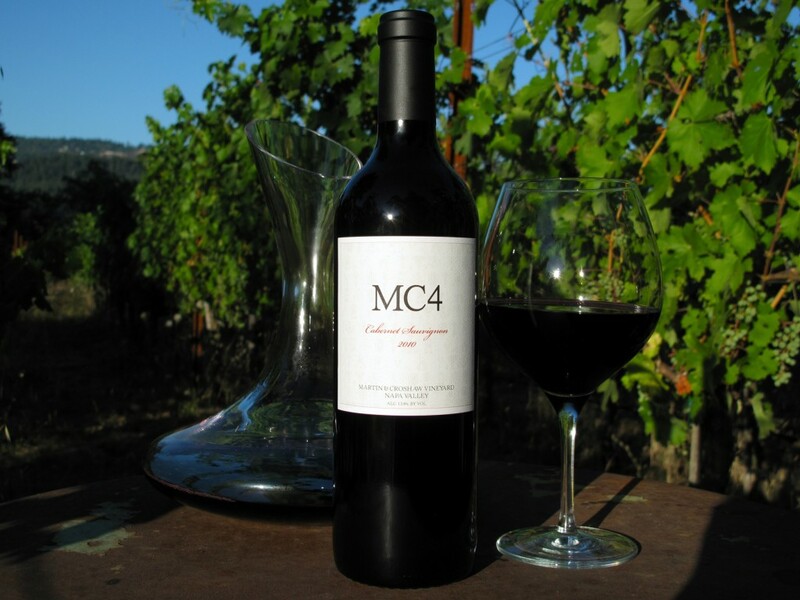 We bottled 27 cases of the 2010 MC4 Cabernet Sauvignon in April, 2012, and sold all of it since. We hand picked our 2009 vintage on October 10th, 2009 at a 24.5 brix, 3.67 pH and a 0.64 titratable acid. The wine was pressed to a French oak barrel on October 25th, 2009 where it was aged for 18 months. Our 2009 MC4 Cabernet Sauvignon is filled with aromas of cassis, dark cherries and toasted nuts. The depth of black current and mouth-filling red fruit is remarkable. It is elegantly structured with dense fruit and a classical Cabernet spice that give the wine a lasting finish.